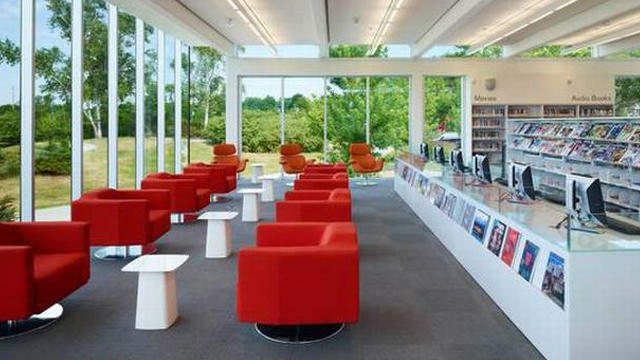 October is National Library Month in Canada, and October 15-21 is Ontario Public Library Week. 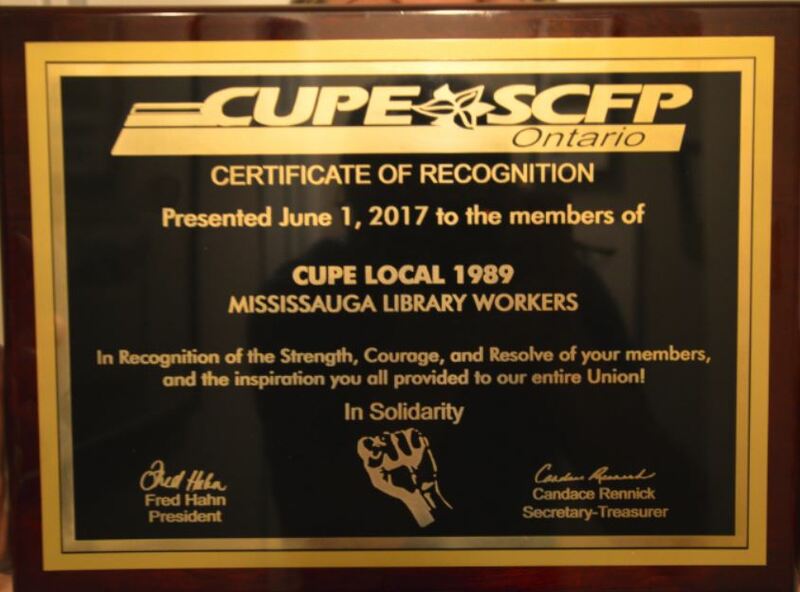 CUPE 1989 takes this opportunity to celebrate libraries and library workers. Public libraries are vital to communities. Libraries support and nurture early literacy, which is the single most important factor in children’s success in school and expanded chances in life. Libraries help bridge the “digital divide”– the gap between those who have regular access to technology and those who do not — helping to reduce social inequality. Libraries offer vital resources and support to newcomers, to help orient them to Canada. Libraries extend community to older adults, who may be isolated or unable to access resources and entertainment on their own. Libraries provide a safe space for teens and young adults, with quiet spaces to study and social spaces to learn skills, build confidence, and gain independence. Libraries offer free computers and internet access to people who need them. Libraries provide the most vulnerable members of our community with a safe space that is warm in the winter and cool in the summer. 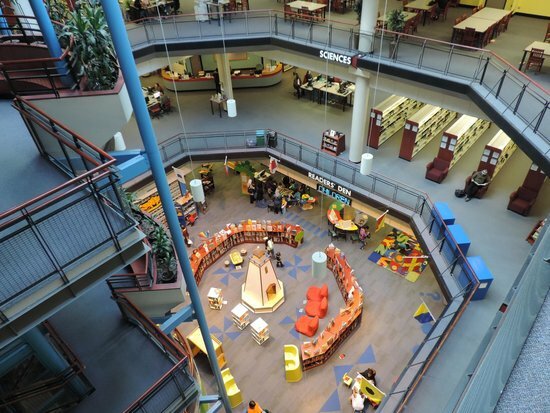 In Canadian public libraries, all this is free — supported by our shared public resources. Books, magazines, music, movies, apps — research, education, entertainment — tech, crafts, author appearances, artist showcases — and more. Libraries work because we do. What do the members of CUPE Local 1989 do? We sort and shelve books, movies, music, and magazines so you can find them. We transport those items between libraries so you can conveniently pick them up at your local branch. We catalogue materials to make them accessible. We process materials so we can track them, and keep our collection vibrant. We create and lead storytimes for children and families. We innovate and facilitate creative, hands-on programming for tweens, teens, and adults of all ages. We help you find resources so you can access services and participate in your community. We partner with educators and experts in our community to offer you a wide variety of exciting, innovative, free programming. We respond to your requests and keep our collection responsive to your needs. We introduce you to a wide array of digital resources and teach you how to use them. We help you research, whether for school, or personal research for health, careers, crafts, and other needs. We facilitate book clubs, author visits, and other literacy programming. We connect local authors and artists with audiences. We are passionate about libraries — and about our union. We are hard-working, dedicated, educated library workers, who work together to create the Mississauga Library System. We contribute mightily to our community, and we believe that public libraries should be fully funded and fully staffed. 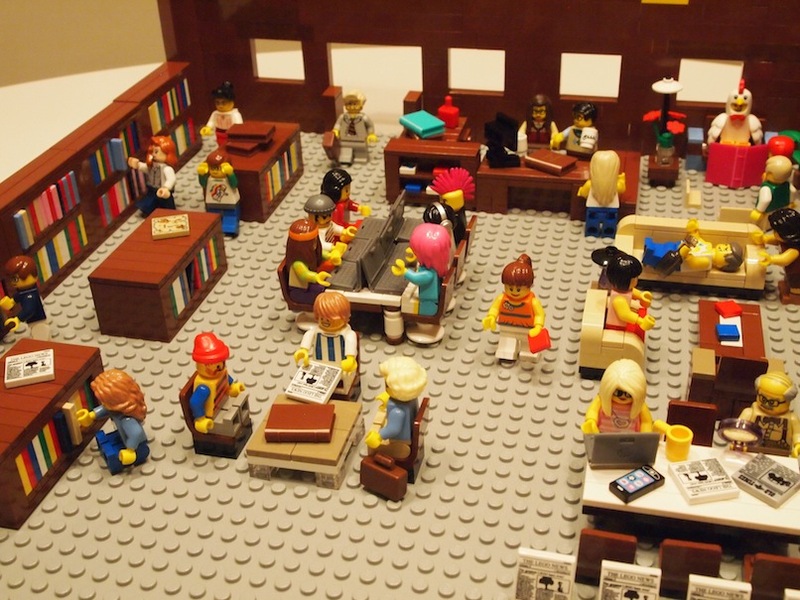 The members of CUPE Local 1989 welcome you to our libraries and remind you: libraries work because we do! September 30 is Orange Shirt Day. Orange Shirt Day acknowledges the harm that Canada’s residential school system has done to generations of indigenous families and their communities. It affirms our commitment to ensure that everyone around us matters. Orange Shirt Day opens a conversation about the legacies of the residential schools — a conversation all Canadians must have. It is a day for survivors to know that they matter. It is a day to acknowledge the past and commit to a more inclusive future. Orange Shirt Day grew out of Phyllis Webstad’s own experience at residential school. On the first day of school, her shiny new orange shirt, given to her by her grandmother, was taken away from her. Phyllis organized the first Orange Shirt Day in 2013. The Aboriginal Council of CUPE Ontario urges CUPE members to show support and encourage participation in Orange Shirt Day this September 30. Participation is very easy: wear an orange shirt, and tell people why. Groups all over Canada will be organizing Orange Shirt Day events. For more information about Phyllis’ story, and to see events near you, go to Orange Shirt Day. Great photos of events from past years are here. CUPE 1989 mourns the loss of Heather Heyer, the 32-year-old woman who was murdered by members of a hate group while peacefully protesting in Charlottesville, Virginia. We stand together, opposed in the extreme to the White Supremacist agenda. We stand together for the dignity and equality of all people. We stand together in solidarity and love. The following statement was released last night by CUPE Ontario. We will not let the virus of hate spread. Hate crawled up from the sewers of Charlottesville, Virginia on Friday and flooded the streets with thousands of white men baring torches and chanting unbelievable hatred. Many thought we were past such horrors, that the days of torches and pitch forks held high by angry white men screaming hate were gone for good. We might have hoped that the racist haters that still exist understand that this kind of venom just won’t be tolerated by most people in our society. With Friday’s rally of violent white supremacists this hope died. What happened in Charlottesville was an overt manifestation of what is experienced by millions of First Nations, Black, south Asian, Hispanic and most non-white people everyday. What is exceptional about this moment, is that there is a President in the US who has been fanning the flames of racist hatred. None of us can afford to stay silent. The future of our society is at stake. And we cannot be fooled into believing this is a problem only south of the border. We have already seen branches of the so called “Proud Boys,” attack a First Nations’ rally in Canada. Affiliates of the white supremacists behind Charlottesville are organizing in Canada. Their propaganda has been found postered in neighbourhoods all across the country. It is true that we are living through difficult times because of increasing economic inequality. Many working people here and in the United States are losing their jobs, being forced to take low-paid and precrecarious work, struggling to make ends meet. It is this vulnerability that racist haters, white supremists and neo-nazis are trying to exploit to pit us against each other. Let’s be clear, it is not racialized people that are taking jobs away from working people or responsible for the increase in part-time, temporary low-wage jobs. It is the largely white corporate elite who keep shipping jobs off shore so they can exploit other racialized workers in sweatshops. They are the ones who rake in hundreds of billions in profits while cutting jobs, privatizing the things we all own in common and refusing to pay a living wage. We must all rise together against racism and hate. It is only together that we can truly address the inequalities in our society. In June, I had the honour of speaking on a panel at the Sisters of the Roundtable, organized by the women’s committee of the Toronto and York Region Labour Council. At that event, Sarah Ali spoke with such passion and eloquence about Islamophobia, and how we must combat hate, that I wanted to share it here. My name is Sarah Ali and I am a member of the Organizing Committee Against Islamophobia (OCAI). We are a committee of progressive community organizations, political parties, cultural groups, non-profits, unions and faith centers. We have come together from many different areas of struggle to recognize that the current political climate in North America is one of white supremacy and Islamophobia. Islamophobia does not exist in a vacuum. We are 16 years into the War on Terror. Sixteen years that have marked a ramping up of Islamophobic political and public discourse. A political and public discourse required to justify the invasions and wars of imperialism and regime change in Iraq, Afghanistan, Libya, Syria and the list goes on. A discourse that dehumanizes Muslim lives, and renders brown bodies disposable. The same discourse that says that it is normal or even brave to kill Muslims through drone bombing in Pakistan, also says that Muslim women require saving. From themselves, from Muslim men, but never from the white security guards who, under [former Prime Minster Stephen] Harper, would force women to remove their veils for the citizenship oath. This discourse is enormously pervasive. Studies show that Canadians fear Muslims far above any other minority. And it is enormously useful. This discourse allows Prime Minister Justin Trudeau to increase Canadian military spending by 65 billion dollars, and simultaneously call his foreign aid policy “feminist”. To applaud himself for accepting 25,000 refugees while taking part in the invasion and war of regime change in Syria. As though there are no women there. It allows for the unconditional support of Israel and the occupation of Palestine. A place where women give birth at checkpoints because even the unborn babies in their bodies represent a “security threat”. Islamophobia doesn’t just justify a foreign policy that destroys the lives, homes and families of Muslim women. No, it also plays a key role in shaping surveillance culture domestically. I refer to Bill-C51: the bill initially packaged as the Omnibus Crime Bill, but now referred to as the Anti-Terrorism Act of 2015. Or how about the Barbaric Cultural Practises Act proposed by Kellie Leitch and passed under Harper? A law that codifies whistleblowing against Muslim families, but purportedly saves Muslim women. Or the Safe Third Country Agreement, which bars Muslim women fleeing violence in the United States from entering Canada, even though Donald Trump has openly called for a Muslim registry, and a ban on travel, among other things. But, Islamophobia is not just harmful to Muslims. Sikh men have been targeted, attacked, and even murdered in Canada because the sheer ignorance of white supremacy confuses the Pagh for the Imama. Hindu women have been told to “go back to Arabia”, because the existence of brown skin on a woman labels her foreigner, terrorist, enemy, Muslim. It is within this foreign and domestic policy context that we see the recently released report citing the 60% increase in hate crimes and hate related attacks against Muslims. It is within this context that we see the increasing visibility of Islamophobia – in the candidacies of Kellie Leitch and Marine LePen, and the elections of Donald Trump and Theresa May. Public figures now openly call for the surveillance, detention, deportation, and bans on Muslims. At the same time, we are confronted by the open presence of far-right, nationalist, and fascist groups. Fascist groups that make unlikely bedfellows, but who find themselves able to recruit, unite and attack under a common hatred of Muslims. The JDL (Jewish Defense League), the Soldiers of Odin, the III%ers (three percent-ers), and even Hindutva fascist groups have diametrically opposed ideological bases, but come together once a month to convene at Nathan Phillips Square. They show up at Peel School Board meetings and performatively rip up Qurans as a gesture of their strength. All the while, standing shoulder to shoulder with Toronto Police Services. The message is clear. Muslim lives, and especially Black Muslim women’s lives are disposable. Muslim children’s ability to pray in schools – a policy that was implemented decades ago – is no longer acceptable. When Ottawa police services killed Abdi Rahman Abdi, and then parade about the city with bracelets that “stood in solidarity” with the officer who murdered him, they are simply protecting public good. When Black and brown children in Toronto have armed officers in their classrooms, they are providing a “healthy learning environment”. When six Muslim men are massacred in a mosque simply for being Muslim, it is a “lone wolf”. Excuses after excuses being made to tell our community what we already knew. We are useful scapegoats. We are useful scapegoats for austerity and unemployment. How often have you heard that immigrants, refugees, and “brown people” are taking our jobs? Of course, it is our government who is cutting social programs, selling off public services, closing schools, and gutting the welfare state. So I’m sure the question on everyone’s mind is where to we go from here. The situation looks bleak, and for Muslim women, it feels even bleaker. The answer lies in building a coalition of progressive forces. When the JDL and the SOO show up on the streets of cities across Canada, it is our duty to confront them. When they argue in public forums that Muslims, refugees and immigrants are causing unemployment and austerity, we must continue the fight for a $15 minimum wage. When Desmond Cole and Black Lives Matter call on us to eject armed police officers from Toronto school boards, we need to be there – physically, with our letters to the editor, and on social media. When Indigenous communities say that Grassy Narrows needs clean water and that Canada 150 is actually 150 years of genocide and colonialism, we give up our Canada Day plans and stand in solidarity with them. We must build a people’s coalition that calls for policy change. That unites to repeal the legislation that makes Canada unsafe. We must abolish indefinite immigration detention, and create a path to residency and citizenship for undocumented workers and their families living in Canada. We must ending the support for wars of imperialism and regime change. We must get Canada out of NATO, take back the money that is being spent on war and militarism and use it to support our communities through publicly owned housing, schools, and childcare. We need a judicial system that supports victims of domestic and sexual violence, brings justice for the 1500 Missing and Murdered Indigenous Women, stops the police from killing unarmed young Black men, and provides comprehensive mental health care to LGBTQ youth. Our struggles are connected, and we must fight together for a better future. It’s all of us or none of us. An injury to one is an injury to all! CUPE 1989 Celebrates Our Strike-iversary! 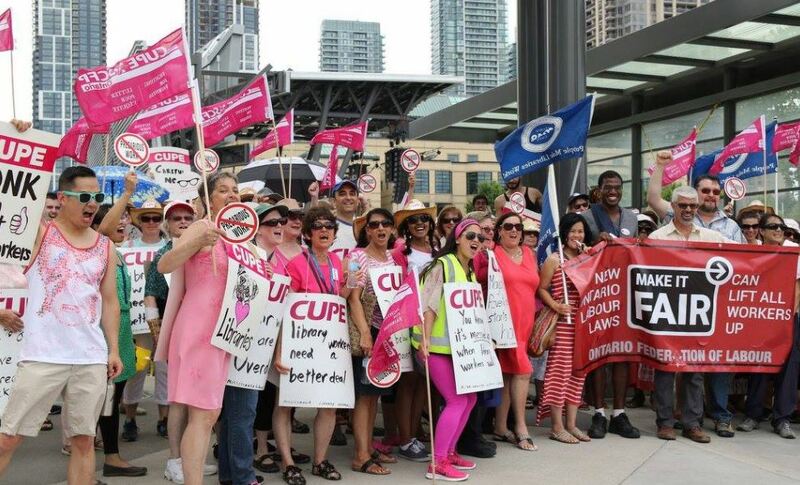 On July 4, 2016, the members of CUPE Local 1989, Mississauga Library Workers, walked off their jobs and onto the picket lines. 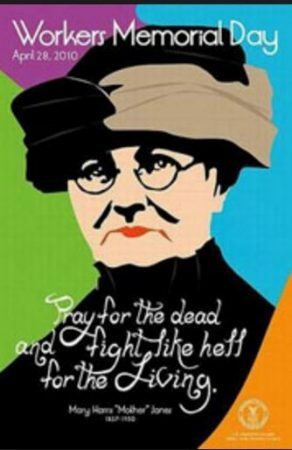 It was the first strike in our local’s history and the first strike against the City of Mississauga. Three days earlier, in the largest turnout our local had ever seen, members voted overwhelmingly to reject the City’s final offer and exercise the most powerful tool that workers possess. We brought our Pages, our lowest paid members and 25% of our membership, from slightly more than minimum wage to $15/hour in one leap. We fought off proposals from the City that would have pushed our part-time members — more than half our membership — further into precarity. We made small but significant gains for our part-time workers. We did not go nearly as far as we wanted for our part-timers, but we did improve their contract, and we set the stage for gains in future bargaining. We fought off City proposals that disrespected and burdened members who need sick time, and other outrageous demands. We won a 1.75% increase for all our members for each of four years. This is still below cost of living! The cost of living rises about 2% each year, and most workers fall farther behind every year. However, after 0.5% increases for three consecutive years, we were proud to win 1.75% for all our members, full-time and part-time. It must be said, too, that none of these changes affect the taxpayers of Mississauga in any way. Mississauga residents who question how their taxes are spent might look to the City’s soaring executive salaries, which now total nearly $2.5 million. Managers who earn six-figure salaries — and who enjoy healthy increases of 3%, 4%, and more every year — are also public employees. So much of what we gained from our strike doesn’t appear in our collective agreement. The solidarity and strength we built, the deep connection our members now feel toward our union, the growth in our members’ confidence — we benefit from these changes every day, in ways large and small. Our members found their voices, some for the first time. And once you find your voice, you never go back. Local 1989 is endlessly grateful to the people of Mississauga for their support. Library customers — the people who use the excellent services that we provide — overwhelmingly supported our goals. So many residents called and emailed the City, that phone lines were jammed and email bounced from overflowing inboxes. Customers wrote to their Councilors, passionately defending our cause and calling on the City to offer us a fair contract. Local 1989 is also forever grateful to the Canadian labour movement for the overwhelming support we received. CUPE Ontario, CUPE National, the Peel Regional Labour Council, Peel District CUPE Council, the Toronto Public Library Workers, the Peel Children’s Aid Society, the Brampton City Workers, York Region workers — the list goes on and on. We never could have done it without you, and more importantly, we never had to. 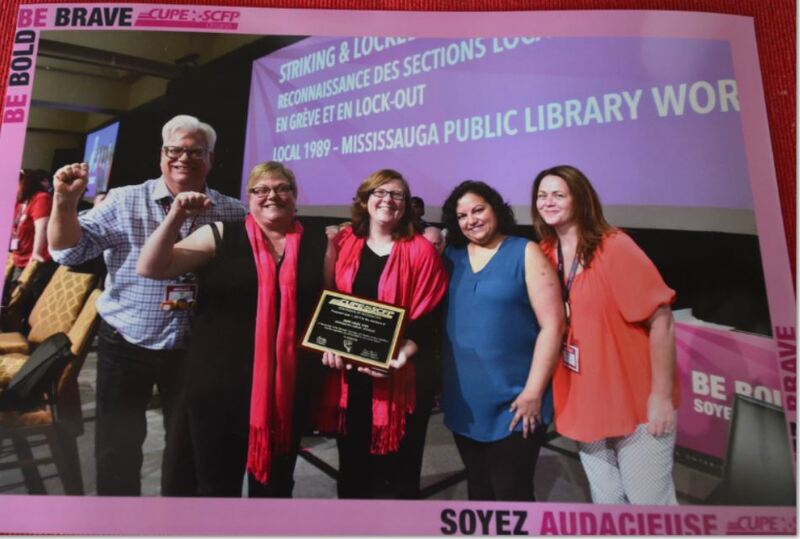 CUPE 1989 was tremendously proud and honoured to be recognized at the CUPE Ontario Convention this week. 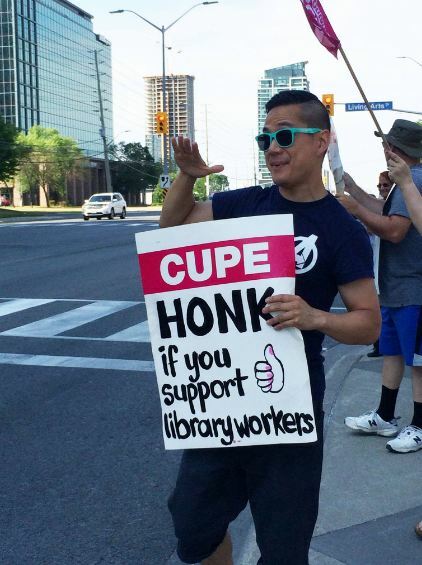 The Mississauga Library Workers were one of 13 CUPE Ontario locals to have gone on strike or be locked out during the past year. It was fitting that instead of keynote speakers, convention organizers decided to gather the striking and locked out locals for a townhall. 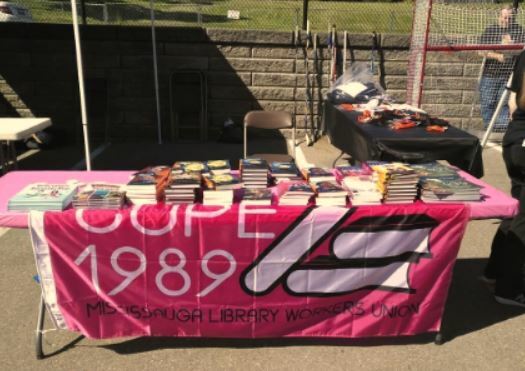 Also this week, CUPE 1989 participated in our first community event as an independent local. At the Bread & Honey Festival in Streetsville, we gave away new books, each with a beautiful 1989 bookmark inside. The books were biographies of notable Canadians written for children and youth. 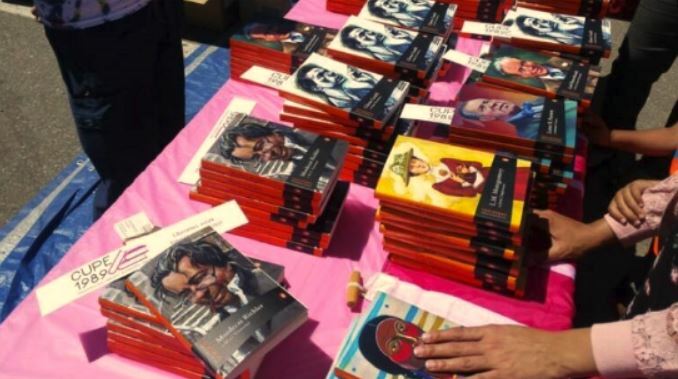 Everyone loves free books! We gave away around 1,000 books and had to pack up early when we ran out! These gifts were our way of thanking the community for their support during our strike, as well as spreading the joy of reading. 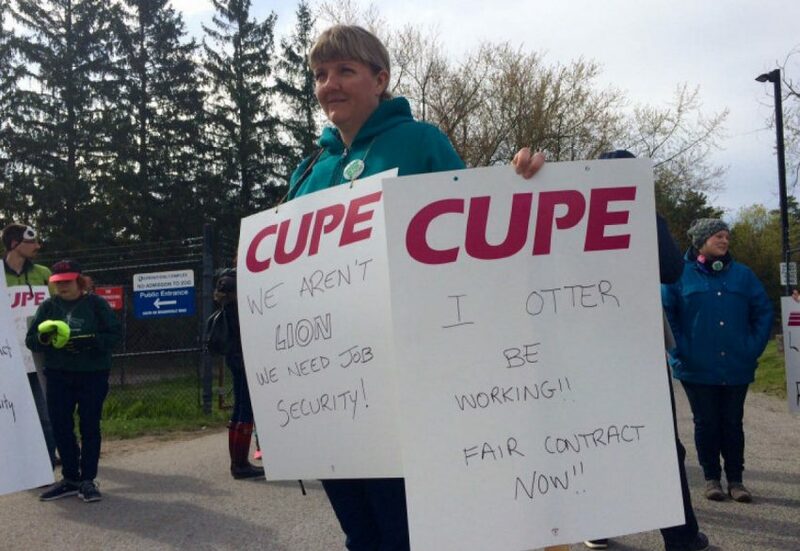 Members of CUPE 1600, Toronto Zoo workers, are on strike to protect good jobs that support our communities, as well as the best possible conditions for the 5,000 animals in their care. 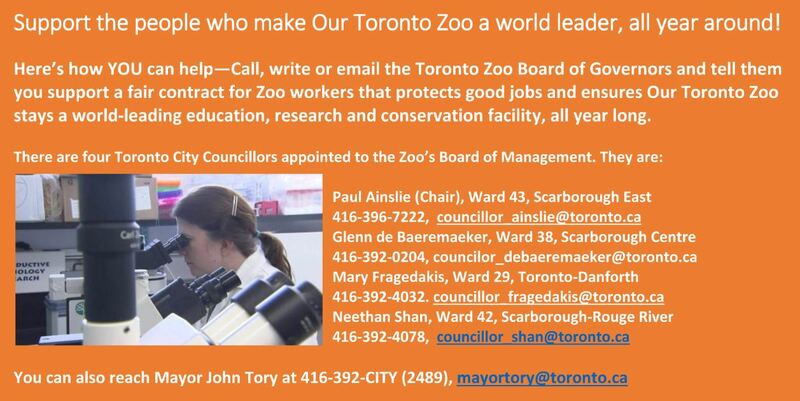 Toronto Zoo management wants workers to accept a contract that weakens job security — which means more precarious jobs in the GTA and a lower standard of care for the animals. You can’t maintain a world-class education, research and conservation facility with unstable, precarious workers. In 1997, Toronto Zoo workers were on strike for nine weeks. Through their struggle, they achieved an important contract provision called a “minimum complement”. This means that the Zoo can farm out some work to private contractors, but it cannot employ fewer than 150 full-time, permanent employees. This is good for the workers, good for the animals, and good for our communities, as people with decent, full-time work support the economy and the social fabric in ways that precarious workers cannot. Now Zoo management wants to remove the minimum complement provision from the workers’ contract. This would mean that dozens, possibly hundreds, of people who now have decent work, with benefits and a pension, would soon be unemployed! There is only one reason employers try to remove minimum complement provisions — because they plan to fire permanent employees and hire private, for-profit contractors. The contractors usually pay minimum wage — and pocket the difference. Let’s be clear: privatization doesn’t save money. Taxpayers never see a savings. (Remember, CUPE members are taxpayers, too!) All privatization does is shift public money into private hands. In other words, the employer is demanding that workers sign a contract that will put them out of work. In effect they would be signing their own termination notice! Would you want to do that? The Zoo workers have no choice but to say NO, and to defend the benefits they’ve won and protected for 20 years. Every union member — and every working person — should support them. Ask yourselves, too, which is better for animals — to be cared for by a stable, consistent number of full-time staff who are paid decently for their work, or a rotation of part-time, minimum-wage workers who invest little in their jobs, because the employer invests nothing in them? Decent jobs for Zoo workers mean decent conditions for animals. If you can get to the CUPE 1600 picket line, the workers will truly appreciate your effort. Picket information is here. Whether or not you can visit a picket line, we can all email the Zoo Board of Governors, and demand they offer their workers a fair contract. It doesn’t have to be anything long and involved. “I love the Toronto Zoo and I want Zoo workers to have a fair contract! We want good jobs in our communities and fair deals for the workers who provide our services!” is enough. Contact information is below. 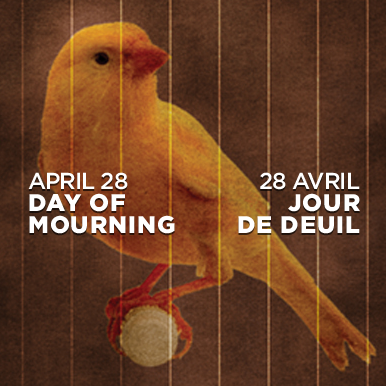 April 28 is the Day of Mourning for Workers Killed or Injured on the Job. The canary is a potent symbol and a powerful reminder. This small, fragile bird was the only thing that stood between miners and a suffocating death. The world over, workers are little more than canaries in their own workplaces. No worker should ever be killed or injured because of work, yet it happens on a regular basis. In our current climate of precarious work, it is happening more frequently. When workers do not have guaranteed work, or don’t get enough hours, or earn too little to survive, they are much less likely to speak up about unsafe working conditions. Employers know this. In the precarious workplace, all too often there is scant attention given to health and safety standards. Privatization of services also causes workplace injuries and death, as companies — with no public oversight — cut corners to squeeze more profit out of services that should not be generating profit. Understaffing also causes injuries and deaths, as workers are required to do work previously assigned to two or more workers. Working alone has become commonplace in many fields. Working alone means there is no one to administer CPR, to help if an accident happens, to call for help if there is a violent confrontation. Injury and death on the job are not merely “accidents” or “tragedies” that just happen. All too often, they are the result of precarious work, austerity measures, and privatization. All too often, they are preventable deaths. On April 28, the Day of Mourning for Workers Killed or Injured on the Job, we should pause to mourn our losses and renew our commitment to ending such tragedies. Full-time staff has been reduced by almost 30% over three years. In that same time period, the salaries of the president and CEO increased by a shocking 75 percent. And the services these CUPE workers provide are vital indeed. 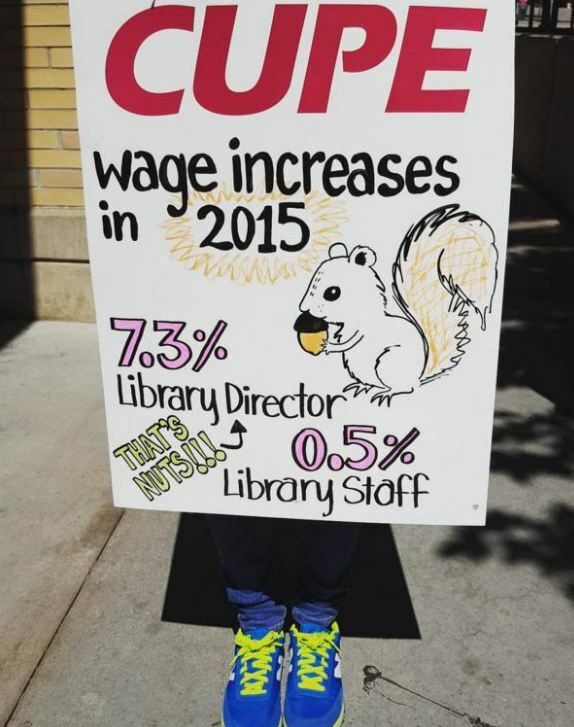 What do the members of CUPE 2073 do? 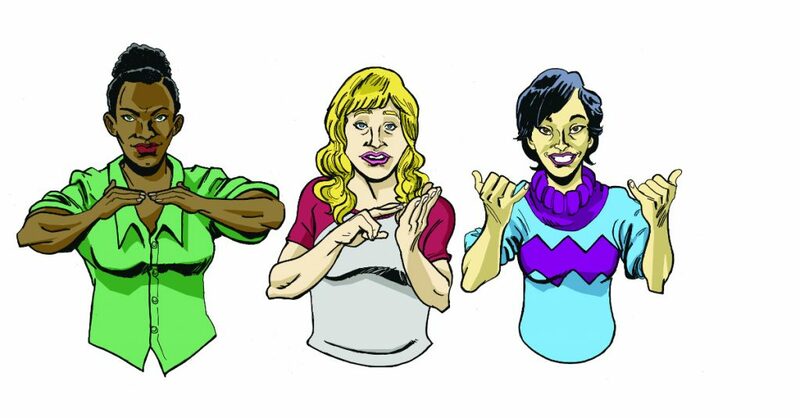 — Highly skilled sign-language interpreters use sign language and spoken language to provide clear two-way communication between deaf and hearing people, so that deaf people can participate in mainstream life. — Community workers provide coping and communication skills to older adults, including help with assistive technology, so seniors can remain safe and independent. — General support workers provide a wide range of services and assistance so that people with different degrees of hearing loss can manage daily life. — Settlement workers provide services and guidance for Deaf, oral deaf, deafened, and hard of hearing newcomers, and teach daily life skills, to help people adapt to life in Canada and live independently. — Counselors provide professional support for mental health issues, addiction, abuse, and other urgent needs, and help clients connect with appropriate healthcare resources. — Audiologists and audiology assistants administer hearing tests, prescribe hearing aids, fit people with devices and teach how to use them, and even repair hearing aids. Members of the CUPE 1989 Executive Board signing “fair contract now” at the CUPE 2073 picket line. Canadian Hearing Society CEO Julia Dumanian earned almost $269,000 in 2016, $115,000 more than her predecessor earned in 2013. Dumanian was appointed CEO in 2015, after being fired on from her previous position at Cambridge Memorial Hospital for “outstanding and ongoing governance and management matters,” according to then-minister of health David Caplan. Dumanian has declined to speak to the media and has made no public statements about the strike. 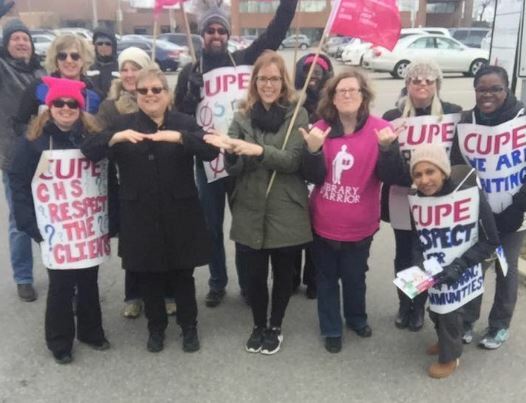 The members of CUPE 2073 are standing strong, fighting for a fair deal for themselves and quality services for the people who use their services. They need our support. Picket lines are active in 21 Ontario locations, and donations to the strike fund are greatly needed. See the CUPE Ontario website for picket locations and times, and where you can send donations.